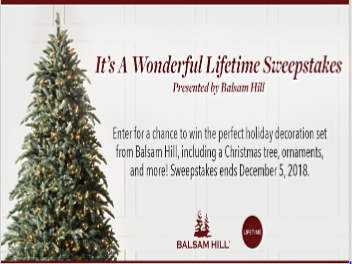 It’s A Wonderful Lifetime Sweepstakes – Win a Balsam Hill Christmas Tree & more! Win a Balsam Hill Christmas Bundle worth over $2,000 (includes an artificial tree and more)! ENTER SWEEPSTAKES HERE – Lifetime Sweepstakes page. ELIGIBILITY – The It’s A Wonderful Lifetime Sweepstakes brought to you by Balsam Hill is open to legal residents of the fifty (50) United States (including the District of Columbia), who are at least eighteen (18) years of age, or the age of majority in their jurisdiction of residence, whichever is greater, at the time of Entry. SWEEPSTAKES ENTRY PERIOD – The Sweepstakes commences at 12:00 PM Eastern Time (“ET”) on November 6, 2018, and ends at 11:59 AM ET on December 5, 2018.
sets, two (2) Sponsor-specified Christmas cheer sets, one (1) Sponsor-specified tree skirt, one (1) Sponsor-specified tree topper, one (1) Sponsor-specified wreath, one (1) Sponsor-specified garland, and one (1) Sponsor-specified LED candle (such items, collectively, the “Grand Prize”). The ARV of the Grand Prize is $2,210. WINNER’S LIST – For the name of the prize winner, available after January 5, 2019, send a self-addressed stamped envelope, to be received by February 5, 2019 to: The It’s A Wonderful Lifetime Sweepstakes brought to you by Balsam HillWinner List, c/o Advantage Sales & Marketing LLC, d/b/a The Sunflower Group, 360 Lexington Ave, 19th Floor, New York, NY, 10017.